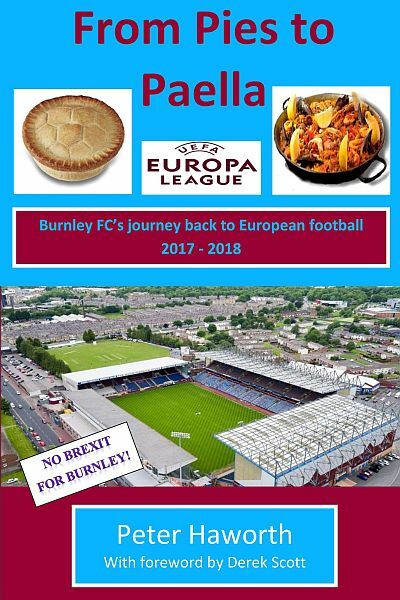 Burnley enjoyed a fourth season in the Premier League in 2017/18 enabling Peter Haworth to write a fourth book in his series of Premier League Diaries. The latest is entitled From Pies to Paella and charts the season that many pundits didn’t expect, a second successive season in the Premier League. It’s a funny old game is football. Burnley, after a season of Premier League survival at their third attempt, should by all the known laws of gravity be sinking like a stone again. A town of under 100,000 souls, with a ground capacity circa 22,000, can’t possibly survive among the big guns. At least that’s what the experts think, and the bookmakers, but not what Burnley folk think! Not for us capitulation in the face of overwhelming odds. No, for us it’s a challenge to be welcomed. What would be the outcome of the fourth Premier League campaign? The supposedly inevitable relegation battle with survival being the best to be hoped for? Not for these lads! Starting the season with an improbable away victory at reigning Champions Chelsea, they showed their intent. Could it last? You bet it could as Burnley set out to be the ‘Best of the Rest’ in their pursuit of the top six. From a team who in the previous season couldn’t buy a win away from home at any cost, they were transformed into away day heroes, losing only five times on their travels. Only once in the bottom half of the table, and that for just one week following the second round of fixtures, the Clarets were for the most part on the brink of the unthinkable. What odds on ‘little old Burnley’ once again daring to challenge for a place in European competition. Not for 50 years had we left these shores to play competitive football, but as the season rolled on and we rode high, the prospect became a distinct possibility. A magnificent five match winning sequence in March and April, including three consecutive away victories, turned the fans dream into reality. A Europa League place was ours! This is one man’s personal view of another incredible season for the perennial underdogs who consistently defy gravity. Whilst primarily written for the football fan it also features tales of the author’s other passion, walking in the glorious countryside of the north. The author describes himself as a ‘Veteran Claret’ having been a regular at Turf Moor since the 1959/60 League Championship season. Thirty-seven years working in the beleaguered Lancashire textile industry have given him the resilience to endure anything that a season supporting the Clarets can bring. In his time as a supporter he has seen many highs and some terrible lows, but through it all his loyalty to the cause has never wavered. Now retired and reaping the fruits of his labours, he is thoroughly enjoying the unexpected pleasure of seeing his hometown club compete in the best league in the world. Long may it continue! The book is available from AMAZON at £12 and is also available in the club shop at Turf Moor.